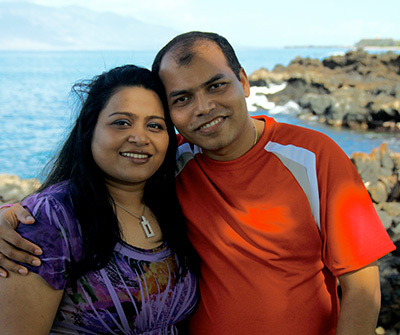 Rashmi Jyotiprakash came to the U.S. from India for his master’s degree and a better future. An entrepreneur from a young age, he had already owned his own consulting business in India, so when he came to the U.S. he was already looking for opportunities to open another business. When Rashmi saw the business plan for a new marketing business, it was an answer to his prayers. He was excited about his new business from the beginning. In spite of her doubts about the business potential, however, Smita was happy for the opportunity to work in partnership with Rashmi in all aspects of their lives – something that wouldn’t have been possible pursuing separate careers. Working together, their business grew quickly, and they were able to leave their corporate jobs behind while still in their twenties. Today Rashmi and Smita live very comfortably in the Chicago suburbs. Because they worked so hard to earn it at a young age, they are most proud to have the flexibility to be full-time parents to their three daughters while at the same time being full-time business partners. Now they can plan their business around their life, instead of the other way around. As Rashmi and Smita have achieved success in their business, they also give their time and energy to support worthwhile charities in the local area near their Chicago home. They are especially active supporting Easter Seals and the U.S. Dream Academy due to the programs these organizations have developed to meet the needs of children and returning veterans. They truly understand the value of helping others and have made it a priority in their lives.